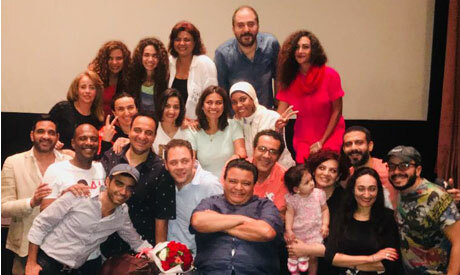 Famed Egyptian director Khaled Galal is reviving his play Qahwa Sada (Black Coffee) with its original cast almost a decade after its successful debut in 2008. The first edition of the play was based on the graduation project from the second Actor's Studio at the Creativity Centre, managed by Galal, and was performed at the Cairo International Festival for Experimental Theatre (currently the Cairo International Festival for Contemporary and Experimental Theatre). Black Coffee rose to fame on stage and TV, with many of its cast members moving on to becoming very successful pieces in the mainstream TV and film scene. Well-known actors who can trace their beginnings back to Qahwa Sada such as Mohamed Farrag, Amir Salah Eldin, Hisham Ismael, and Hossam Dagher return now in the play's revival giving the audience a unique opportunity to relive the play that brought them into the limelight while creating a memorable impact in Egypt's theatre scene. The show consists of a sequence of separate scenes that aim to find “reconciliations” to many of the important social values which, as the creators of the show think, have died. The new edition play will be performed in the National Theatre on Monday 17 September and Tuesday 18 September, celebrating the ongoing Jubilee edition of the Cairo International Festival for Contemporary and Experimental Theatre. The 25th edition of the festival is currently taking place on almost all of the famous stages in the capital. It opened on 10 September and continues until 21 September, presenting 25 plays (chosen from over 160 submissions) from many countries, including China, Canada, Switzerland, France, Poland, Russia, Mexico, Italy, Georgia, Morocco, Brazil, Tunisia, UAE, Syria, Palestine, and Kuwait. Alongside Black Coffee, the Festival will also revive other Egyptian performances that won the best directing prizes through the past years, including My Aunt Safia and The Monastery, as well as Talk in Secret. The Cairo International Festival for Experimental Theatre launched in the late 1980s. It was suspended in 2011 and returned as the Cairo International Festival for Contemporary and Experimental Theatre in 2016.
he Cairo International Festival for Contemporary and Experimental Theatre.